It was good to go to the Mt. Carmel cemetery today. I needed to be able to see the damage myself. 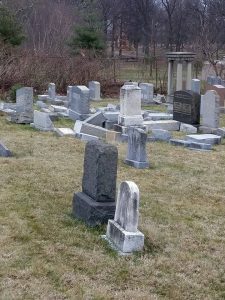 Media reports have been so mixed, some reporting “dozens” of headstones overturned, while others reporting over 500 headstones impacted. It is easy to understand the confusion when you go: Mt. Carmel is no longer an active cemetery; the graves are crowded and the ground very uneven. You can see fallen headstones here and there as soon as you enter, but what is not clear is how long they were in that state, or how they came to be that way. Indeed, many had evidently fallen long ago. But as I made my way into the heart of the graveyard, it was stunning to see whole rows of headstones toppled, some in pieces, and some fallen on top of each other. There was no graffiti of any sort that I saw. It was shocking and very sad to witness. After walking around for a while, speaking with various individuals including some rabbi colleagues, I felt called to sit among the fallen stones engraved with families’ names – none of my own family, but names of my people, names of my tribe. Closing my eyes, I felt their peace. In that moment, I actually did not feel that the peace of those who had passed had been interrupted. Rather, the stones seemed to be saying to me: Don’t worry about us, this isn’t about us! This is about you, your children’s future and your community’s future! Look beyond this cemetery… but also, do not forget us. I continued to feel immense sadness, but there was also a sense I got that urged me to open my eyes and look up toward the heavens. The cemetery has no trees, and the gray sky was vast above me. “I lift my eyes up to the hills; from where does my help come? My help comes from the Holy One, Maker of heaven and earth.” (Ps. 121) Sitting on the earth, and looking up toward the heavens, I felt reassured and fear left me. I remembered that I was sitting on holy ground. I went to the Mt Carmel to connect with something beyond my distress and fear, and to find some kind of direction (both, admittedly, for myself and for my congregation). And I surely did – this place, like all cemeteries, is a place that transcends the news of the day or the policies of particular government. I connected with a steadiness and a comfort that one can only find among these quiet monuments, testaments to whole lives. There, I found the courage to ask myself: What is my life? What will be my testament? We will raise and repair these stones, and this cemetery will look better than ever, that is sure. But let us take this opportunity such adversity presents us with: to reflect on our lives and raise our ourselves, our community, and our society anew. The scourge of antiSemitism is not new, but of late it has come out from the shadows. In recent decades, American Jews have grown comfortable and complacent. Let us also take the moment to step out of that comfort and find a new and awakened voice. That is the message I got from the headstones today. Really, they were saying it all along, but today I was there to hear it.